Grabe the day that was... September 28, so strong winds with heavy rain! And take note, even if our office suspended the Manila operations, I chose to stay in the office up to 5 pm because I felt that it was safer inside the office than going outside and make my way home. From the office' windows, I clearly saw the great effect of that super typhoon! I managed to finish one service call (it means, another 2,500! hehehe) and by 5 pm I decided to went home. Fortunately, there was no rain that time and the winds were calm. 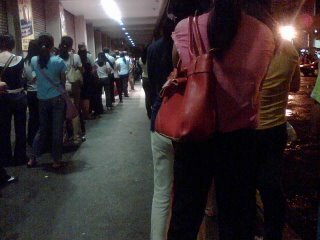 I didn't have difficulty riding bus and jeepney but the most disgraced event on that day was the "blackout pehonomenon"! Kainis!!! 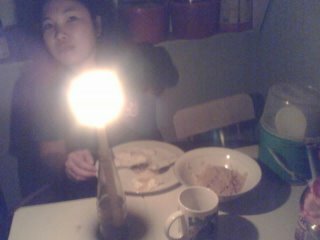 We had our dinner (of course I only ate bread and water) using candlelight, and it was so difficult to eat that time. 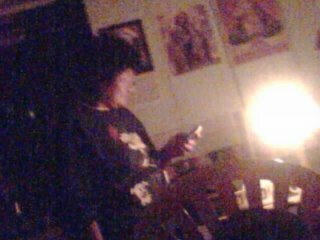 My mother was also using candle to send text message to my dad informing of the situation we had that day. It was a good thing that the next day at about 8 am, the power resumed so hindi na masyadong nakakainis. Then that day I clearly realized the great destruction Mr. Milenyo did. The trees along Ayala were improperly dumped and the billboard in Estrella, was such an unfortunate scene (heard that the driver of the FX that was affected died). Then yesterday, October 2, I said to myself that there will be no destructions in my way home. I decided to get out from the office at 9 pm so that I can be sure that riding bus and jeepney will be so easy. But I was definitely wrong. See the line? Nasa dulo ako! Haba ng pila at konti pa ang sasakyan!!!! But I still thank the Lord for protecting me and my family. We were still lucky that we still have our home, a shelter for us and most of all, WALANG BAHA!!!! Thank you God!